In continuation of our earlier blog on the same topic, we are trying to understand the various factors other than the lack of open meetings causing rural India fails to prosper as expected? 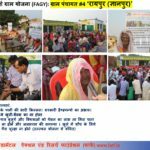 Though lack of open meetings in villages are major causes for non-development but there are various other inter-link causes for hampering the growth in rural India. In this blog, we may not able to cover each factor in details, but we can list down the significant factors as root cause and we can provide details of each factors in later blogs. Agriculture or Farmers are most popular words in democracy like India because more than half of the population (~65%) belong to Rural India. For rural India, Indian Government has all the schemes to support farmers, pension for poor old age/widow/handicapped under social welfare schemes, free education in Government school (under Right to Education), Food security system under Public Distribution System (PDS) to provide food and non-food items to India’s poor, 100 days of wage employment under MNREGA schemes (Right to Work), houses for homeless people, financial support in toilet construction, Handpump repair etc. Then why Rural India still fails to suffer? Let’s go step by step starting from children to old age by each age categories in life. Each village has primary school & secondary school with free education for children. Government provides support for books, school dress, meal etc but why all most of the children from middle class still prefer to go to the private school. Is it lack-of proper infrastructure, unhealthy environment or non-quality in teaching because of non-proficient teachers? Let’s look the age of youth came out from college. As we discussed above, most of the middle-class family who can afford fee, enrol their children in private school (or exceptional Government Navodaya / model school). Students passed out from Government primary & secondary school (say, type-1 students) are always behind in the race of competitiveness to get good colleges for engineering, medicals etc. Students from private school in rural India are those who really go out for professional courses or competitive exams in majority. These are the students who secure seats to some extent either in reputed professional colleges by clearing competitive exams (say, type-II students) or getting admission in private colleges on paid seats (say, type-III students). Since majority of the students in rural India are of type-I & type-III, they later struggle for getting good job. Type-III students still get low skill job in the metros/big cities, but their struggle generally continue whole life because of low salary package in their job. What about Type-I students? Will they be used by politician, or they become forced non-skill farmers, will they get MNREGA jobs etc? Now we reach at the age of working class in rural India where mostly those youth are left who were not able to secure good job in big companies, administrative jobs etc because of their poor education in young age. Now, these youths are mostly misguided or used by the political party based on the casteism, polarised ideology etc. Exceptional are always there, but do they have courage to help villages to prosper by speaking truth, participating in Government imitativeness without being biased, standing up for their rights in villages? Now let’s look the age of old age, widows or handicapped who are in Rural India and need to be covered under the social welfare scheme. Government has made pension schemes online so that anyone with eligibility criterion can apply online itself? Then where is the problem if it is so simple. Problem lies in the complex system where you need to submit documents like Income certificates, handicapped certificates, family registration proof etc but none of the documents, in general, can be made freely without paying bribe to officer or hefty fee to Common Service Centre who deal with officer on people behalf. Government’s primary & secondary school are not efficient because of non-trained teacher without advance technology usage. These teachers have degree but either their degrees are itself question mark or there is no proper monitoring system in schools to force them to be sincere while teaching in class. Most of teachers have very casual approaches in terms of attendance, professional teaching etc. Not good job opportunity for type-I & type-III students in rural India because of no proper effective implementation of skilled India in rural places, no proper industry, no effective English communication program in Rural India so that they can easily get job in Metros/big cities or can do online services, rural BPO job etc. Most of the Government schemes in rural Indian like Social welfare schemes, PDS system, MNREGA, Pradhan Mantri Awaas Yojana etc are failed because there is rarely any skill people left in the villages who can raise the questions in right manner with right authority and can-do proper follow up. People who migrated from village to town or cities, they either nor getting time or not interested to solve the problems at rural India. Though exceptional are everywhere, few NGOs, individuals have recently started moving back for villages but is that percentage enough to solve Rural Indian problems? Answer is NO unless education people & urban educated people do support the rural Indian problems. This is the era of Digital India where anyone can support by various means by residing in any part of the world. But, big question is that do they really want so? Everyone think that why should I bother for others? ← WHY RURAL INDIA FAILS TO PROSPER? Well identified issues!!! But what about solutions??? Please let us know if you have better solution.